250 pages | 4 B/W Illus. 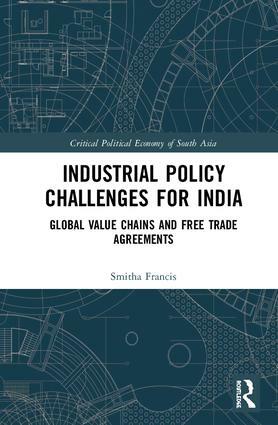 This book looks at the debates on global value chains (GVCs) and free trade agreements (FTAs) as springboards for industrial development in developing countries, especially India. It connects the outcomes in GVC-led industrial restructuring and upgrading to industrial policy choices in trade and FDI liberalisation, in particular those through FTAs. With the share of manufacturing in GDP stagnant at around 15–16% since the 1980s, India’s policymakers have pinned their hopes on greater integration into GVCs to revitalise the manufacturing sector. The multiple FTAs the country has signed over the last few years, specifically the ones with the Association of Southeast Asian Nations (ASEAN), South Korea, Malaysia and Japan have been sought to be rationalised using the same argument. The book argues that failing to factor in the industrial policy causalities involved in sustainable indigenous technology development, structural barriers to the entry into GVCs, the assessments of the available evidence on the adverse impact of trade and FDI liberalisation as well as existing FTAs on firm-level incentives for undertaking domestic production, and the industrial policy constraints imposed by FTAs can prove costly for the trajectories of developing country economies, including India. Rich in data, this book will be useful to scholars and researchers of development economics, economics in general, development studies and public policy as well as government bodies, industry experts and policymakers. Smitha Francis is Consultant with the Institute for Studies in Industrial Development (ISID), New Delhi, India. Her research interests cover the interfaces between different processes of trade and FDI liberalisation, industrial policy, digital transformations, and manufacturing sector development. Previously, she has worked at Economic Research Foundation (ERF), New Delhi, the Secretariat for International Development Economics Associates (IDEAs) and Research and Information Systems for Developing Countries (RIS), New Delhi. She has also served as a Visiting Faculty member at the South Asian University, New Delhi and Ambedkar University Delhi. In addition, she has been a consultant in projects sponsored by the Department of Commerce, Government of India; Indian Council for Social Science Research (ICSSR); Rosa Luxemburg Foundation, Brussels; Centre for WTO Studies, New Delhi; Frederick S. Pardee Centre for the Study of the Longer-Range Future, Boston University; UN OHCHR and UNICEF.